Abit is a company that was in the headlines for the wrong reasons during 2004 and 2005. 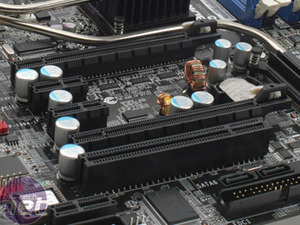 However, since the USI acquisition that happened before CeBIT, the company has showed signs of getting back to what it does best - making great motherboards for enthusiasts. When we were at CeBIT, there were already signs that the company was back on track - the layout of its KN9 SLI really caught our eye. Unfortunately though, the board didn't quite live up to our expectations. Even though the KN9 SLI disappointed us, we still believe that the company is showing signs of a comeback with an awesome layout design. At this year's Computex trade show, we saw Abit's upcoming AW9D-MAX motherboard - a board with a big reputation to live up to. Abit's MAX series has been right at the top of the company's product line up since the dark days of 2002. 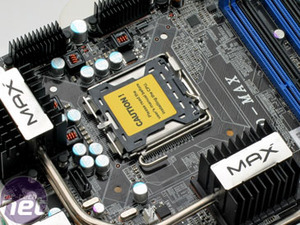 There have been some truely innovative boards in the MAX series, along with some tremendous overclockers too. The first iterations of the MAX series came legacy free (well, almost) and then the bomb was dropped when Abit launched it's legendary IC7-MAX3. Ever since then, every new addition to the MAX series has been compared to the IC7-MAX3, and rightly so. 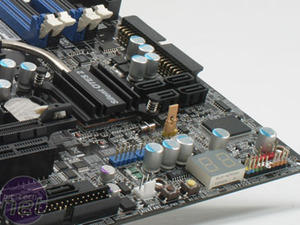 There were many more additions to the MAX series on both Intel and AMD platforms, but the IC7-MAX3 was the one that stood out - it is possibly one of the best motherboards I've ever had the pleasure of using. Yesterday, Abit came to visit the bit-tech offices, bringing along the world's first AW9D-MAX that has been let out in to the wild. Since this board is not in mass production for another week and is currently using a pre-production BIOS, it wouldn't be right to review the board. Also, the limited time we had with the board meant that there simply wasn't time to evaluate the AW9D-MAX to its full potential. A full review process would take a week to complete, once all aspects of our performance and stress testing are explored - we will be coming back to re-visit the AW9D-MAX once it is in the channel. However, we hope that this preview will serve as a taster of what is to come when Abit ships to retail next month. 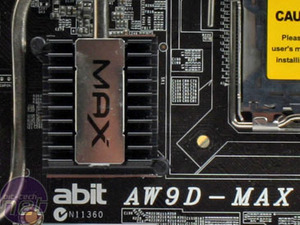 Abit has already had one go at making a motherboard based on Intel's 975X Express chipset, but the AW8D-MAX was a little late to market and didn't come with support for the recently-released Core 2 Duo processors. The AW9D-MAX is based on the same chipset and this time comes with support for Core 2 chips - there are refinements made to the previous implementation of the chipst and we're sure that Abit has used its knowledge of working with the chipset to come up with a stonker. In that respect, there seem to be a lot of very good Core 2 ready 975X mobos out there, because most motherboard manufacturers are on their second generation implementation of Intel's current flagship chipset. Anyway, lets have a closer look at Abit's latest addition to the MAX line up.